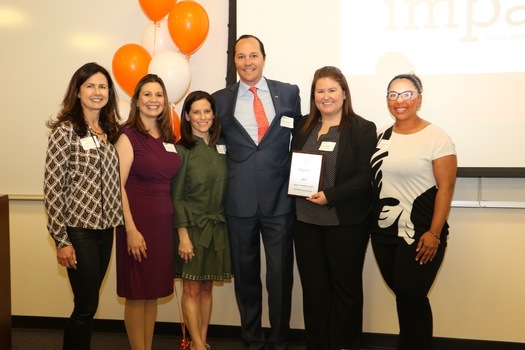 Stamford, CT - IMPACT FAIRFIELD COUNTY is a collective giving circle that engages women of Fairfield County, Connecticut in local philanthropy on a deeper level. Now in its second year as a philanthropic force in the community, Impact Fairfield County received 51 proposals from non-profits located throughout the county to support new projects or the significant expansion of existing programs. Currently there are 173 members of Impact Fairfield County’s giving circle. After an extensive, months-long review process that resulted in site visits of the remaining applicants and narrowed down the field to five worthy finalists, the $100,000 Impact Grant recipient was chosen by a vote of the membership at the annual meeting held on Thursday, May 4 at UCONN Stamford. The Center for Sexual Assault Crisis Counseling and Education was the deserving winner of the $100,000 Impact Grant for their innovative Lower Fairfield Sexual Assault Forensic Examiners (SAFE) program. 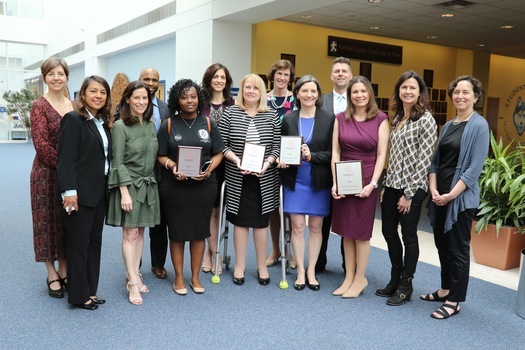 The four other finalists, Building One Community, The Center for Family Justice, International Institute of Connecticut and SoundWaters, were each awarded $20,000 general operating grants. After the announcement was made, Ivonne Zucco, Executive Director of the winning non-profit said, “we can’t wait to get started on this program because we have been waiting for this opportunity for a very long time”. The SAFE program is a coordinated effort between The Center and Greenwich, Stamford and Norwalk Hospitals to provide timely, compassionate and trauma-informed sexual assault forensic exams to victims of sexual violence. For this program, they will train a minimum of 12 nurses, who will later be made available to the three area hospitals. The hospitals will utilize the already existing 24-hour hotline to connect with the program coordinator. If the victim qualifies as a SAFE Kit candidate, the program coordinator will activate the SAFE on-call system and coordinate the arrival of a nurse and advocate to the hospital emergency room. The program will also ensure ongoing training for SAFE nurses, ER personnel and law enforcement. IMPACT FAIRFIELD COUNTY unites women by providing transformational grants to local non-profits. “We are delighted by the quantity and quality of the proposals we have received. They truly focused on some of the most pressing issues facing people in our community,“ stated Wendy Block. "These groundbreaking proposed programs support numerous underserved groups all residing right here in our own backyard. It is an honor to be able to make an impact with the generosity of our 173 members. We encourage other interested in making an impact in Fairfield County to join this effort." In 2016, Impact Fairfield County awarded its inaugural $100,000 Impact Grant to Stamford-based Inspirica, the largest provider of services to the homeless in Fairfield County. Inspirica was able to fully launch its Early Childhood and Parenting Program (ECPP). The ECPP combines crucial early childhood development with a pre-literacy program for homeless children ages zero to five, in addition to offering their parents side-by-side essential parenting skills classes. The program is accomplished through a partnership with two other Stamford-based non-profits, Children’s Learning Centers and Saint Joseph Parenting Center. In addition, operating grants of $30,000 were awarded to Building One Community (formerly Neighbors Link Stamford) and to SoundWaters.